Devotions on the Greek New Testament continues on this path of excellence by introducing these devotionsbased on a careful reading and study of the Greek New Testamentwritten by some of the top Greek scholars of today. Contributors include Scot McKnight, Daniel B. Wallace, Craig L. Blomberg, Mark Strauss, and William D. Mounce, among others. 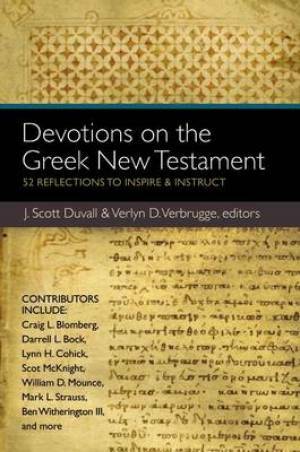 Devotions on the Greek New Testament by J. Scott Duvall; Verlyn D. Verbrugge was published by Zondervan Academic in October 2012 and is our 38492nd best seller. The ISBN for Devotions on the Greek New Testament is 9780310492542. Be the first to review Devotions on the Greek New Testament! Got a question? No problem! Just click here to ask us about Devotions on the Greek New Testament.